BASE UNIT ONLY! ACCESSORIES ARE SOLD SEPARATELY! System has built-in heater which heats injection water to 135°F, Stainless steel tank & wands for quality and durability, Extracts 90% of water, Drying time less than 1 hour. 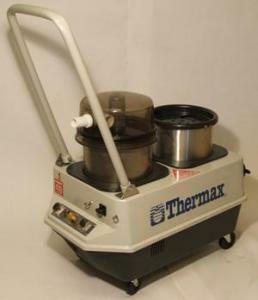 The Thermax "Therminator" Cleaning System offers features no other cleaning system can. Thermostatically controlled heating system for thorough and hygienic cleaning. Powerful, commercial 2-stage vacuum motor for rapid recovery and fast drying time (100" water lift). 4-step professional formulated chemistry for the brightest, freshest carpets. Product was shipped from 2 different mfg locations. That's OK but I should have been warned. When only one box showed up, I called cust support to make sure nothing was wrong and cust support couldn't confirm. Next day rest of shipment showed up so all ended OK. Except it appears that the hose/floor wand may have been "used" as there was cleaning solution still dripping from it. All appears OK and I'm not complaining, just advising. Would be a Thermax issue since all was shipped direct from Thermax. John-until further notice all commercial base units will be shipped from Reno with the accessories coming from LA. In reference to the wands having water in them, all are tested with water pumped through to assure no leaks will happen.